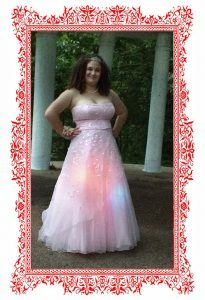 Well, OK, so Smith was probably the only girl at her prom whose fashion statement included Adafruit and a battery pack. Probably the only girl with a glowing gown at any prom anywhere, at least for now. But Claire Smith is comfortable standing out in a crowd if it inspires other teen girls to feel like they can pick up a soldering iron as easily and naturally as a sewing needle. The inspiration for Smith’s illuminated prom gown came from designer Zac Posen, who famously created a fiber optic dress for actress Claire Danes to wear to the Metropolitan Museum of Art’s gala celebrating its “Manus x Machina: Fashion in an Age of Technology” exhibition. Smith was introduced to computer programming in 2015 when she did a Girls Who Code summer immersion program. She learned the basics of seven computer programming languages in seven weeks, and after completing the program she started doing hackathons. This homeschooled student from Parkville, Maryland, actually won the Baltimore Hackathon in 2015 and again in 2017, though with projects incorporating 3-D printing and app-building instead. She is now enrolled in a local community college and will start classes in physics, mathematics and mid-level computer science this year. Enter the dress. The entire project took Smith about two weeks. “I spent more time researching and figuring out how I was going to go about it than actually hands-on making it — that part only took a couple days,” she said. Smith used Adafruit’s Flora, an Arduino-compatible wearable electronics platform, connected to six NeoPixels (tiny LED lights that work with Flora). She stitched them onto an off-the-rack dress and connected everything using conductive thread. The design even features a battery pack stitched unobtrusively into the skirt, so she can power the unit off and on. 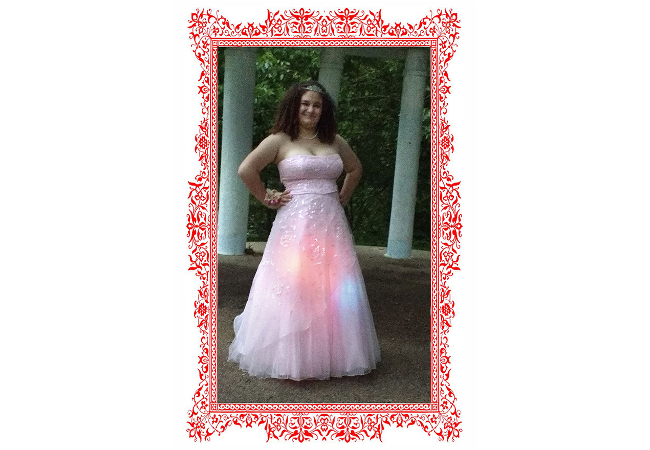 Smith commented that the energy-efficient Adafruit’s two AA batteries kept her dress illuminated all through prom night, and those same batteries are still going strong. Eventually, though, there will be life after the dress, and Smith is ready for it. She has founded a group to teach middle school-age girls in her home schooling community about technology, 3-D printing, and the environment. And, using a $3,000 grant from the National Center for Women and Information Technology and a partnership with Be You, Smith has organized an event for later this fall called “Make It Real” to teach girls both honey bee ecology, and how to 3-D print special water dishes for bees to drink from.